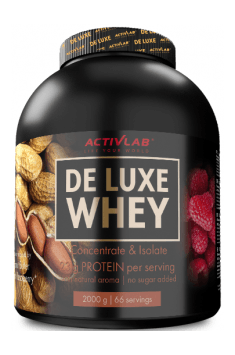 Activlab De Luxe Whey is a high-quality nutritional supplement which combines two forms of whey protein – concentrate (WPC) and isolate (WPI). The formulation is characterised by a high content of indispensable amino acids, especially BCAAs. It is available in several delicious flavours and helps meet the daily requirement of protein. This nutritional supplement comprises concentrate (WPC) and isolate (WPI) from milk-derived proteins in the ratio 70:30. WPC features a high content of carbohydrates and fats which slows down protein absorption. It is estimated that the absorption rate of this form is 1-3 hours. WPI is absorbed in turn within an hour because it has a higher percentage of amino acids (even up to 90%) and a lower content of carbohydrates and fats. Such combination allows you to use the product just after a workout (owing to immediate absorption of WPI) and at bedtime (slower absorption rate due to WPC). The content of amino acids in protein is critical to the absorption rate and usability by the body, which is measured by the BV (Biological Value). WPC has a high content of indispensable amino acids which cannot be synthesised itself by the body and must be supplied in a diet. Because of that, its BV is 104. Due to a higher percentage of amino acids, the BV of the isolate is as much as 159. Such values mean that protein is utilised fully by the body, potentially as a building block for skeletal muscles. Branched-chain amino acids (BCAAs) are an important group of proteinogenic amino acids which help build muscle mass and protect muscles against catabolism. BCAAs include three indispensable amino acids: L-leucine, L-valine and L-isoleucine. Each one has slightly different properties, but all of them stimulate the synthesis of new muscle proteins, inhibit muscle tissue breakdown, promote muscle glycogen synthesis and improve glucose metabolism in muscles. The product contains sugars that occur naturally in milk and is sweetened only with sucralose. Owing to that, the product has a low content of sugar (1 g per serving) and total carbohydrates. What is more, the nutritional supplement features a low content of lactose. Lactose is a natural milk sugar which may cause problems for individuals with decreased activity of the enzyme lactase. This nutritional supplement should thus appeal to individuals with lactose intolerance. Amino acids are the basic building block for muscle tissue and the demand for them increases when you enhance your physical activity. Not only does protein stimulate the regeneration of muscle fibres, which are prone to microtrauma, but also helps repair connective tissue. In addition, tendons and ligaments need adequate protein supply to maintain proper joint stability and motility. Adequate protein intake is essential to achieve your desired muscles in response to strength training. Protein is required for the process of muscle recovery and enhanced muscle anabolism by influencing the synthesis rate of new muscle proteins. Furthermore, protein supply stimulates the activity of agents responsible for muscle mass growth, including insulin and insulin-like growth factor 1 (IGF-1). To sum up, Activlab De Luxe Whey is the combination of two forms of milk-derived protein – concentrate and isolate. Such blend ensures high bioavailability and quick absorption rate of amino acids whcih promote post-workout recovery and muscle mass growth. It is perfect for use just after a strength workout. Cheesecake with orange: whey protein concentrate (from milk, contains soy derivatives) 67%, whey protein isolate (from milk) 29%, aromas, natural orange flavor, thickener: xanthan gum, sweetener: sucralose, anti-caking agent: silicon dioxide, acidity regulator: citric acid, pigment: carotenes. Pistachio: whey protein concentrate (from milk, contains soy derivatives) 67%, whey protein isolate (from milk) 29%, aromas, natural pistachio aroma, thickener: xanthan gum, sweetener: sucralose, anti-caking agent: silicon dioxide, color: chlorophylls and chlorophylline. Cherry liqueur: whey protein concentrate (from milk, contains soy derivatives) 67%, whey protein isolate (from milk) 29%, aromas, natural cherry flavor, thickener: xanthan gum, sweetener: sucralose, anti-caking agent: silicon dioxide, juice concentrate in powder. Peanut butter with raspberry: whey protein concentrate (from milk, contains soy derivatives) 67%, whey protein isolate (from milk) 29%, aromas (containing peanuts), natural aroma of raspberry, thickener: xanthan gum, sweetener: sucralose, anti-caking agent: dioxide silicon, acidity regulator: citric acid, dye: ammonia caramel. Cookie with cream: whey protein concentrate (from milk, contains soy derivatives) 67%, whey protein isolate (from milk) 29%, aromas, thickener: xanthan gum, sweetener: sucralose, anti-caking agent: silicon dioxide, dyes: carotenes and ammonia caramel.